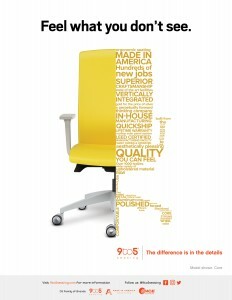 9to5 Seating launches new brand campaign to underline its dedicated approach to providing quality and value to its customers, by ingraining the approach in every aspect of its operation. The objective of the brand campaign is to communicate the company’s new tagline, “The difference is in the details” both internally and externally. 9to5 Seating worked with a Los Angeles boutique marketing agency to explore the company’s culture, mission, values and positioning. An internal brand campaign will be launched to staff, while consumers will experience a campaign that allows them to visualize the brand’s new tagline. This campaign follows the success of the latest advertising campaign, “The Secret is Out,” which focused on the unique company history, its vertical integration and reshoring priority of 9to5 Seating. The campaign was launched in Business of Furniture magazine and was also featured at this year’s NeoCon. The new brand campaign includes digital and social media promotion. For more information and view our new video.